they Say that Russian girls are the most beautiful. Our compatriots nature is endowed with pleasant features, light hair and a graceful figure. Thanks to the good external data, as well as his own work, the girls look beautiful even in retirement. Not surprisingly, many painters and graphic wanted to capture our girls in their paintings. And today we will try yourself in the role of the artist and draw portraits of Russian beauties, and the figure in full growth. When a child draws a portrait of the Russian beauty, he usually portrays the face of my mother. Since this person plays a big role in his life. Therefore, reading with the child stories, you need to develop his imagination and attention. After the tale is read, it is possible to offer the child to draw the main character. And how to do it? easiest way to portray a girl in a skirt and draw her headdress. Let us examine the progress in stages. First, draw a figure of beauty. It will be two triangle United sharp ends in the middle. The bottom figure – it's a skirt, it should be 3 times more the top of the corset. The dress is ready, pririsovyvat circle-the head and do not forget that every person has neck. The hands depicted by rectangles. Don't forget to paint the fingers. On legs put on boots. Left to complete a drawing with some detail. This person is a beauty, braid and of course the kokoshnik. Eyes and nose can be identified by dots, lips – in a semicircle. And the last part – the decoration on the dress and headdress. 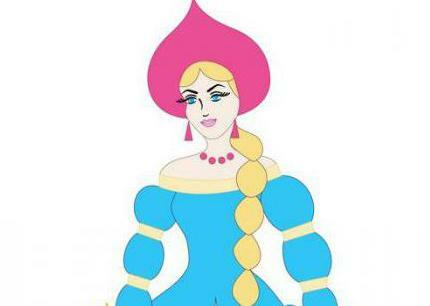 Portraits of Russian beauties do not have to be accurate. If you draw with children, it is easier to portray a comic book character. The child will be pleased with not only the creative process but also the result of it. 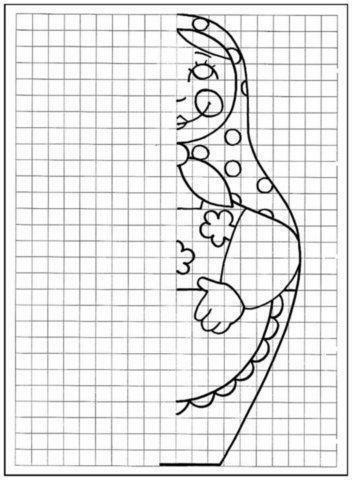 Character of our pattern will be a girl dressed in a fur coat, a long skirt and a fur hat. Standard Russian beauty in winter. let's Start with the layout. On the sheet we will draw not only the girl but also the Church, wood and stones. The planned figure and divide it into three parts. Now the top sector divide in half again. The lower half of the head draw a circle, the top – a hat, draw it oval. Once you can identify facial features. To draw a shape we will be in three quarters, this is the easiest angle. Start drawing coat. Planned to start its keystone. Further detail coat, adding a fur trim. Now the depicted hands. Not to draw the toes, wear on the girl clutch. Now for the skirt. Look interesting, do not forget to depict the folds. Hold the skirt 5 along the vertical lines and the hemline draw a wavy line. There are not forget about the background - in a Church, trees, stones. Our drawing is ready. If the child has artistic talent, then, in principle, it can display on paper not the entire figure as a whole. How to draw a portrait of the Russian beauty? we Need to identify the dimensions of the picture. The face should cover about half or one third of the sheet. Draw an oval outlined in two semicircles line of hair growth. Immediately draw the headdress. It will look like a pointy semi-circle. 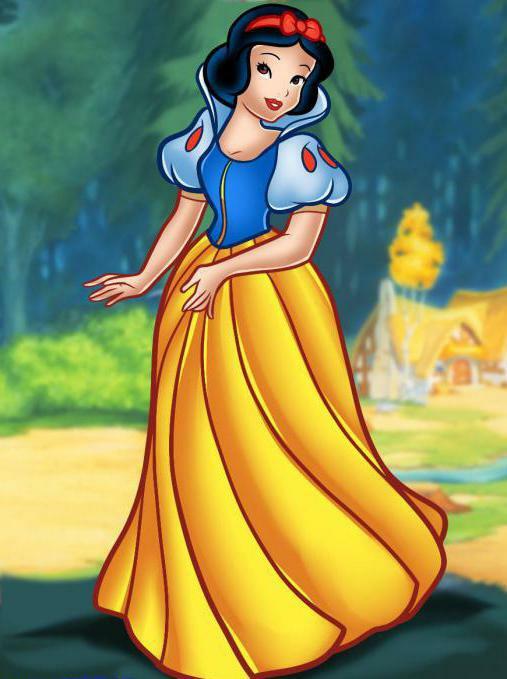 Princesses wear dresses, so this part of the picture should be given special attention. Not to torment the child a picture of the decor, you can come up with a more sophisticated style of clothing. The girl's figure should resemble an hourglass. But the sleeve can be drawn in the form of several connected circles or ovals. Similarly, it is possible to represent and spit. On the neck of the beauties put on the beads. Leaving only the face. To avoid any problems that one eye bigger than the other, draw a girl in a small spread, as if she was slightly turned away from the viewer. Eyes represented by circles, and almond-shaped attach them at the expense of the eyelashes. Dorisovyvaet arc eyebrow, a small semi-circle as depicted by the nose. It remains to outline the lips and our beauty is ready. You can optionally paint the picture. 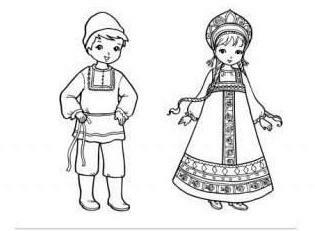 In school, when children are the subject of national costume, they are often asked homework. How to draw a portrait of the Russian beauty? 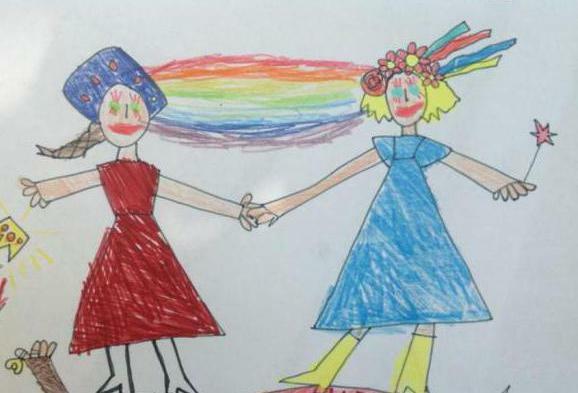 Grade 4 – it is a time when students can already depict people almost certainly. But to draw portraits is a very difficult task. Therefore it is better to choose the theme easier, for example, to depict the whole figure of a girl in national costume. In this figure, the portrait of the Russian beauty in the headdress will also be present, but will not attract attention to themselves. in order to portray the girl, we, again, need to compound the figure on the sheet. To our beauty was not boring, you can finish the young guy. Proceed to the image of the girl. Divide the figure into 4 parts. First one taps on the image of the head and headdress. 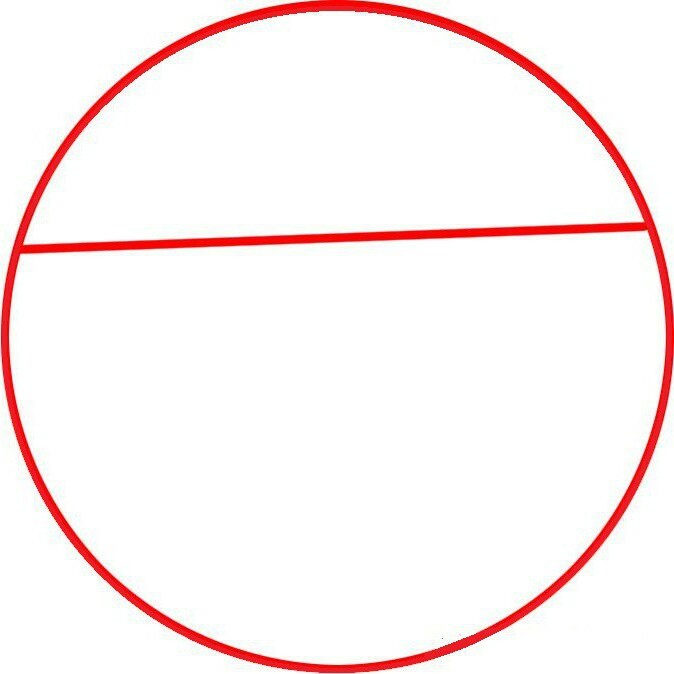 The face draw a circle and headdress in a semicircle. Do not forget in the center to do a little sharpening. A trapezoid with a rounded edge, as depicted by the sarafan. The second of our four part allot. Corners pririsovyvat them to the trapezoid. Also the triangles of the proposed shoes. It remains to detail the figure, draw a face and the pattern on the dress and headdress. By analogy we try to portray the young man. 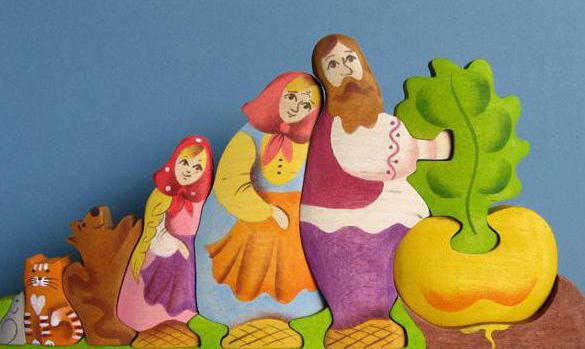 a Classic Russian beauty can be represented in the form of national dolls. Draw the doll can even a small child. Portrait of the Russian beauty depicted in this way, allocate the child from crowd, which will copy the disney princesses. to Draw the doll better in parts. First, you must portray the right half, and then use Windows to mirror your creation. Draw a semicircle, symbolizing the person. The next step – image of the contour. You must copy it from the example pictured above. Now we need to fill the empty space. First, Refine the face: draw eyes, lips, nose and cheeks. Now hand-drawn. It is an oval connected to the palm. It should be noted that dolls can be 4 fingers, not 5. Now let us begin the work. Dress up our beauty in the apron and draw the flowers. Final touch - move the image on the left side. Today, in the fashion of abstraction. So the picture is a portrait of the Russian beauty a modern twist can look outside the box. For example, you can draw a beautiful beam, nice profile, outline the neck line and ear. But the face to draw is optional. 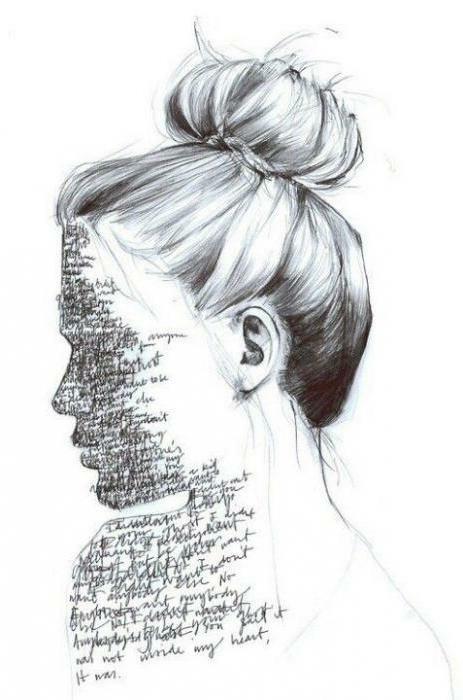 You can do a non-trivial shading, or, in General, to write for eyes and lips poem. It may even be a favorite verse. How to draw a turnip looks like?